Singing and drum beating filled the Krannert Memorial Library as men in saffron robes began the creation of a sand mandala, a traditional Buddhist art design, on March 20 as the first event in a series held on campus. During their five day visit, the monks came to campus, set up various cultural items and spoke to the public on their culture and philosophies while also selling their handmade jewelry, tapestries and other objects. Tibetan monks begin the creation of the sand mandala following the conclusion of the opening ceremony on March 20 on the first floor of the Krannert Memorial Library. Two events were held on March 20, the opening ceremony and the Buddhist practices workshop. Of the six monks, Tenpa Phuntsok was the main speaker during each event because the other monks were not fluent in English. 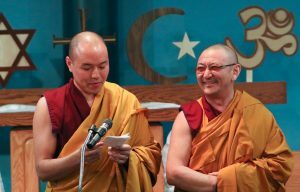 While on a tour in the United States, the Tibetan monks of Dehra Dun, India were invited by the Ecumenical & Interfaith programs to the University of Indianapolis. 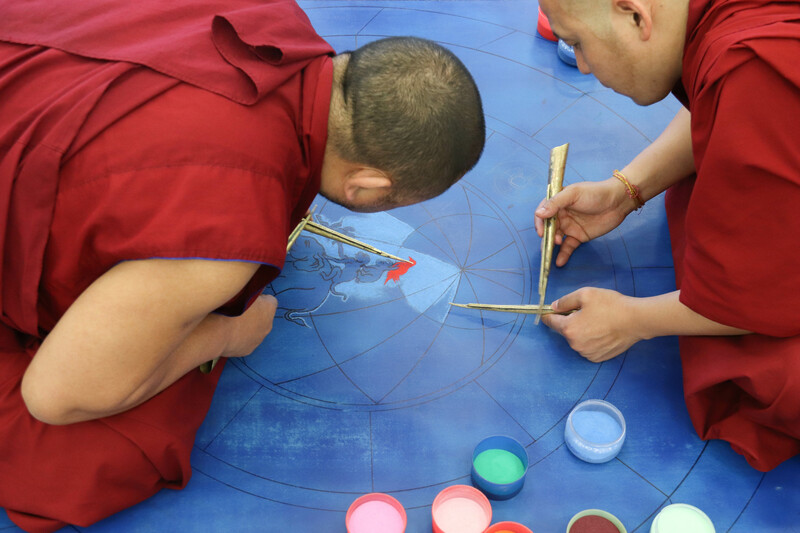 The monks worked on the mandala, which is a picture composed of carefully placed sand pieces, the entire time they were on campus. This mandala was intended to be a universal mandala, different from the ones they built in Tibet, Phuntsok said. It had the intense Buddhist practice message attached, the promise of Buddha, compassion, feeling, wisdom, power of the soul, all for the dedicated monks, according to Phuntsok. The mandala built at UIndy is inclusive of various religious symbols and promoted the idea of a universal harmony, and it is often referred to as the “mandala for all,” according to Phuntsok. After completion of the mandala, the monks threw the sand into the pond by Greyhound Village per Buddhist tradition. The throwing away of the sand traditionally means that the sand blesses all elements and all beings. Freshman psychology major Marlena Lovas said she has been interested in Buddhism since she heard about it in a YouTube video in high school. Lovas said the religion has inspired her and she has incorporated the different religious elements and symbols into her art products on occasion. When she heard the monks were coming to campus, Lovas said she decided to attend the Buddhist Practices workshop to get insight on the aspects of Buddhism. The workshop focused on altar building and was followed by a Q&A. Lovas said that the questions asked were ones that she was also curious about. At the opening ceremony, the main floor of Krannert had visitors gathered around the monks to see the building of the sand mandala. Junior business management major Jenny Davis said although she felt a bit claustrophobic during the ceremony due to the large attendance, it did not take away from the ceremony being a spiritual experience. Monk Tenpa Phuntsok (left) translates for his elder monk during an event in McCleary Chapel on the evening of March 20. They answered questions about Buddhist practices. All of the events were intended to be educational, according to Phuntsok. The events included how to build an altar, teaching the yoga that the monks practice in their monastery, how to create sacred pieces of their culture’s art, how to prepare traditional Buddhist food and an explanation of Buddhist history and how monks use it to live a happy life. The events were aimed not towards coaxing people to believe in the same practices of them, but to learn how to better their lives through the events.